Susan Anderson has been mentoring young drivers through the L2P program since 2014. Despite working full time, Susan spends her spare time helping prepare young people from disadvantage backgrounds to obtain a drivers licence. “People can to think it’s a rite of passage, that we just leave school and go and get our licences,” she says. 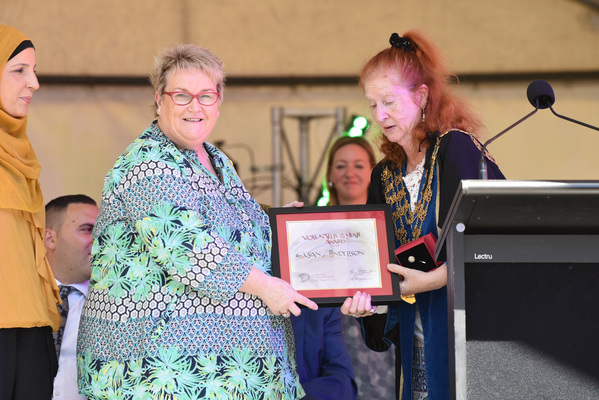 For her dedication, Ms Anderson was announced as the Volunteer of the Year during City of Greater Dandenong Australia Day ceremony on 26 January. She says it was “very lovely” to be recognised. “I really quite chuffed – volunteers do things because they want to. “When we do get something like this it just also brings to the fore how important volunteers are in the community,” Ms Anderson said. “It’s not so much my passion; it’s my desire to make people just so much more aware of the consequences. “I’ve always loved driving. Everyone thinks it’s a right to get their licence, it’s actually a privilege. “If it mean I can make one, two, three or four or more safer on the roads or just be more aware of what’s going on, than getting and turning on the key, and going from A to B – then I feel I perhaps have given them a bit of longer life on the road,” she said.